At the end of December we have an opportunity once again to expand the Kindom of God. 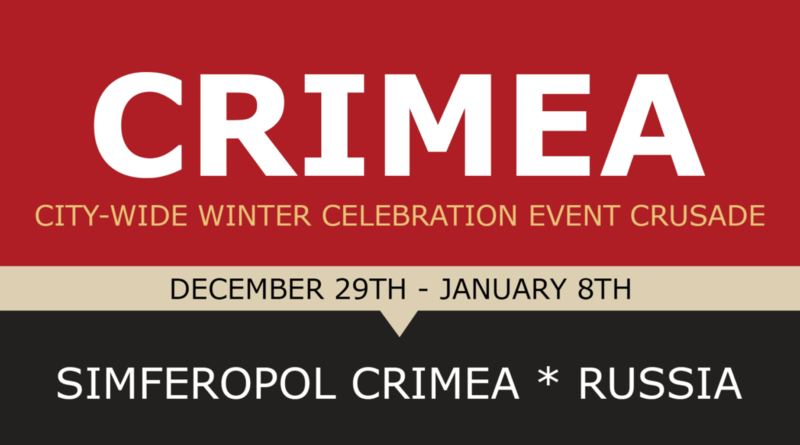 At the end of the year, we will be doing five major ministry outreaches in Russia and Crimea. We are beginning with four services in the city of Moscow, and three citywide outreaches in Crimea. We will be ending with three major Christmas Celebrations in the city of Perm. During these events, we will be giving out over 2,000 sacks of groceries, mainly to elderly women who have very little to live on in the nation of Russia. I need your help with prayer for protection, for supernatural provision, and for God’s overwhelming favor. If you feel it in your heart to help us bring the love of God to the people of Russia and Crimea please pray and ask what He would have you give. There is no gift to small or gift too great that we will not appreciate in helping us to expand the Kingdom of God this holiday season. We could not, and cannot, accomplish this without you. With all of my heart, I pray that this will be the most extraordinary time of peace that you will ever know. Easter Is In Five Days! Self-conscious, People-conscious, or God Conscious? Devon Goulbourne on Lives, Eat, and Breathe Thanksgiving! Copyright © 2019 Mikel French Ministries. All Rights Reserved.